Ruth Eckerd Hall is growing! Construction is underway on our Expanding the Experience project, which includes renovation to our parking lot and entry ways. Because of the ongoing project, please allow extra time for parking, ticket pick up and security clearance. 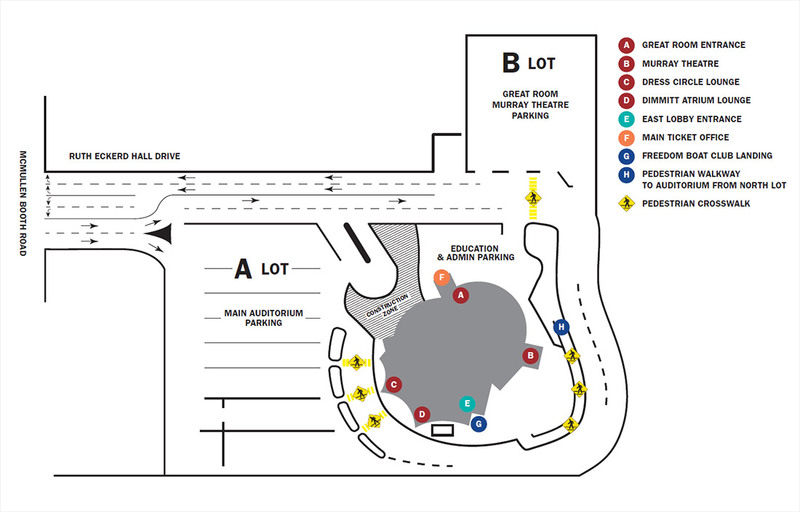 Please note, there is a brand-new entrance off McMullen Booth Road, introducing a new traffic pattern that leads you behind the marquee as you enter Ruth Eckerd Hall Drive. All patrons will be directed to the appropriate parking area as you make your way towards the Murray Theatre. Please note, the main ticket office will close at 6pm. The Murray Theatre ticket office booth located next to the Murray Theatre entrance will open one hour prior to the performance for will call and sales and remain open through show time. The Murray Theatre is located at Ruth Eckerd Hall – one mile north of the Bayside Bridge (SR 611) and the Courtney Campbell Causeway (SR 60). On-site parking is available free of charge.